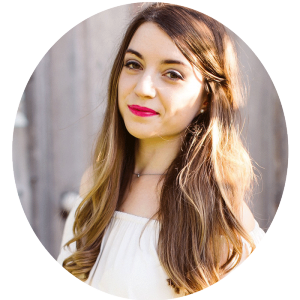 From Lauren: This is another recipe from Michelle, who shares an Autoimmune Paleo recipe each month. Enjoy! Who doesn’t love a simple staple recipe? Especially one that’s packed with protein, healthy fats, and veggies. Count me in! Meatloaf comes to mind as one of those staple recipes that can be pretty so-so, or really tasty. 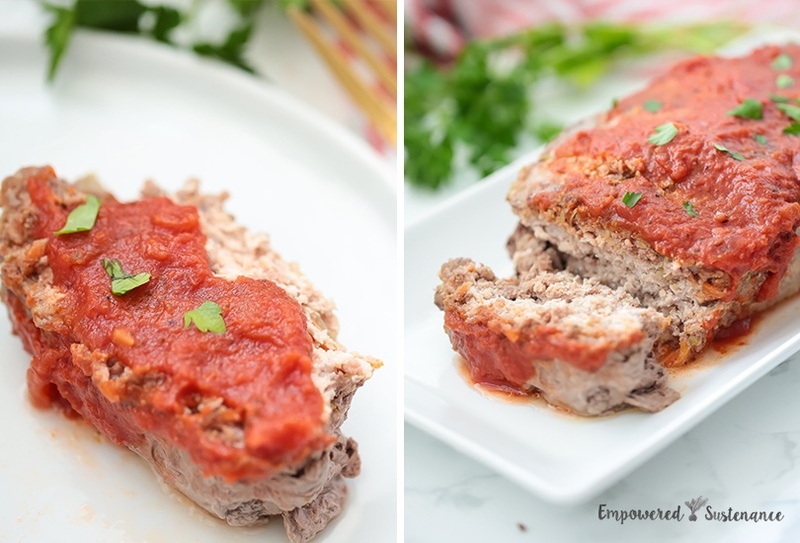 Luckily, this autoimmune protocol compliant meatloaf falls under the tasty category. Traditionally, meatloaf features ingredients like boxed bread crumbs and even straight up brown sugar. No thanks! It can also contain eggs which is fine for most, but not so much for those of us with egg intolerances or are following and AIP diet. This meatloaf is free of grains, sugar, and eggs. Ground beef is the classic base protein to a good meatloaf while ground pork adds extra moisture and flavor. Carrots, zucchini, and onions helps give the meatloaf flavor as well as a bit more structure to hold it together. Garlic, basil and parsley are the nightshade-free flavor agents. Coconut oil also helps with the structure of the meatloaf. Nomato sauce is the nightshade-free substitute to the classic ketchup topping. If you can tolerate tomato sauce, you can easily use a good quality tomato sauce from a jar. 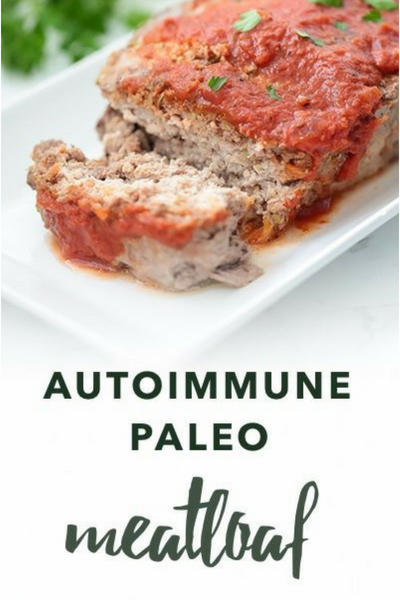 However, if you’re following an AIP diet, opt for nomato sauce, like this Autoimmune Paleo Nomato Sauce. This is essentially a nightshade free version of marinara. Preheat the oven to 375 F and line a 9x5 loaf pan with parchment paper. Using a large skillet, melt 1 tsp of coconut oil and lightly sauté the zucchini, carrots, and onion until soft. Remove from heat when finished. Combine the beef and pork in a large mixing bowl and stir in the sautéed vegetables, and seasonings. Mix well to combine. Add the mixture to the loaf pan and evenly flatten. Bake for 50-60 minute or until temperature reads 160 F with a thermometer. Allow to cool before removing from pan. Top with sauce and extra parsley for garnish.